Fall is just ahead and it’s the perfect time for bold action: adding edibles to your suburban front yard. If you have a conventionally landscaped front yard and you aren’t sure how to begin, here are some ideas to help you get started. For the front yard there is still an aesthetic norm to overcome in lawn-centric suburbia, but that convention has been shifting steadily. Growing vegetables, herbs, and fruit boldly in plain sight needn’t be the eyesore of the neighborhood if you give some thought to how they will fit into your garden design. In my opinion, both edible and ornamental plants coexist in a beautifully in a garden. It doesn’t have to be one or the other. To start, you'll have to consider the exposure to direct sunlight, at least 4-6 hours per day, and the condition of the soil. Check with your local UC Master Gardeners for more details on planting and soil prep for your region. They will also have seasonal planting charts. Sign up for their excellent monthly newsletter that reminds you about seasonal garden tasks, including planting edibles. Below are some simple ideas for small additions with the potential for a big impact. If you have existing flowerbeds, that’s a great place to begin. If not, you might consider removing a strip or patch of lawn to make a combined flower and edibles bed. This would be nice as border along a walkway or fence, or even in the center of a lawn (remove and prepare a square or round shaped patch). Small shrubby herbs such as thyme (choose from lemon or lime thyme) or sage (add a trio of culinary sage with blue-gray leaves, tri-color sage edged with purple, cream and green, and yellow sage) fit well among flowers, and they hold up to the mild frosts in our San Francisco Bay Area. 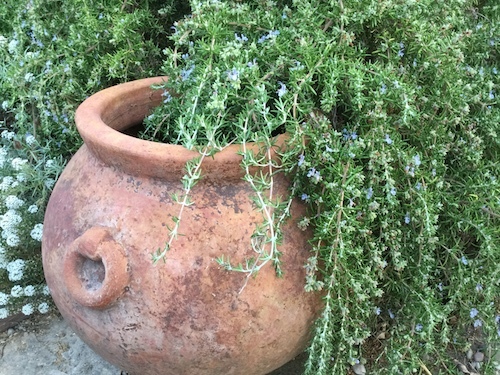 Rosemary is a popular, large landscaping plant that is covered with sweet blue-lavender or purplish flowers for months of the year. 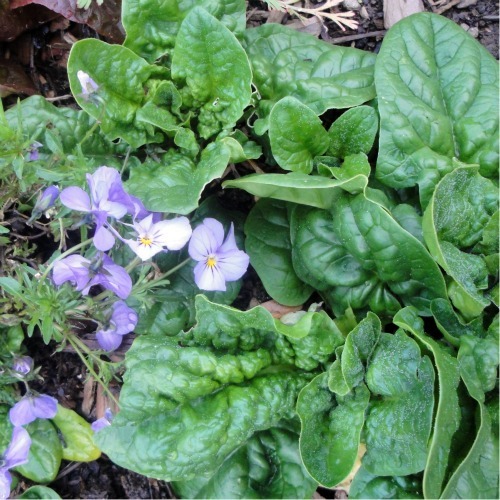 You can easily slip in vegetable seedlings when planting out flowering annuals or among bulbs. Spinach, lettuces, kale (including ornamental kale), and Asian greens, can be grown in fall since they prefer cooler temperatures and can be grown during winter in our region. These leafy green veggies will add attractive foliage to a bed of flowers, and if you really want to be on your game, plant edible and beneficial flowers, such as calendulas, and add nasturtiums and marigolds for summer. The viola family, which includes violets and pansies, are good cool weather choices for fall and are high impact for their varied colors. This group is semi-perennial in mild winter climates and provides lots of blooms fall through spring, going dormant in hot summer weather (some will reseed). For annuals such as nasturtiums, which are frost tender, wait until spring. But beware: if you buy nursery seedlings make sure they were grown without pesticides and herbicides, otherwise, don't eat the flowers! If you have the space for them, artichokes are a spectacular addition to the garden. 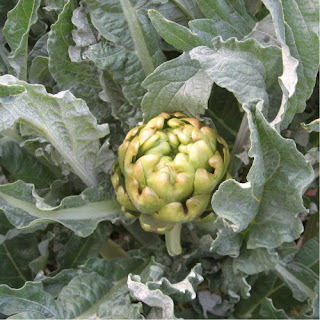 Their bold foliage is striking, and in spring they'll reward you with edible artichoke heads. I particularly love the violet ones, such as Violetto and Purple of Romagna. Romanesco is a tightly rounded variety that is tinged with purple. The green globe types have equally beautiful foliage. 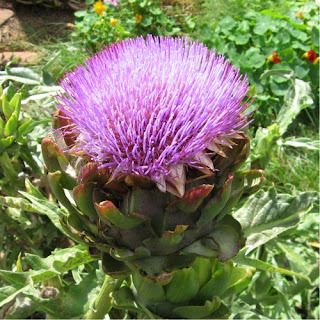 Fall through early summer is the best time for artichokes. They tend to go dormant with the heat of summer, at this point you can cut them back and keep them mulched. Mine are shaded in the later part of the afternoon for the hot sun so they begin to sprout new growth if I water them occasionally during summer. Towards fall they really start to bulk up. All of them will eventually yield huge flowers with purple stamens if you leave the heads on the plants. I always leave a few to flower, then watch the bees enjoy them! Planting into containers is another great way to experiment with edibles since containers can be moved around, grouped in different locations or used as a welcoming feature on a porch. Numerous colors, sizes, shapes and textures are available to match or brighten up your existing landscape. Containers filled with flowers and lettuce are sure to be a conversation piece. For the coming cool months you could pair lettuce, kale, or spinach, in containers with edible flowers for a beautiful display. 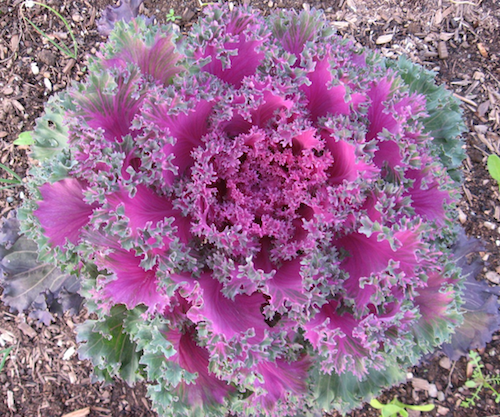 Mix with ornamental kale for an extra showy focal piece. 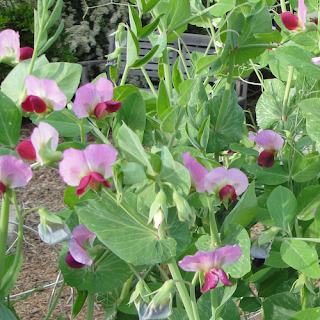 I also love growing snap peas and snow peas over winter and early spring. They are beautiful on a trellis, and you can plant flowers and leafy greens around them. I have several different trellises in the front yard of different types and sizes for climbing edibles. 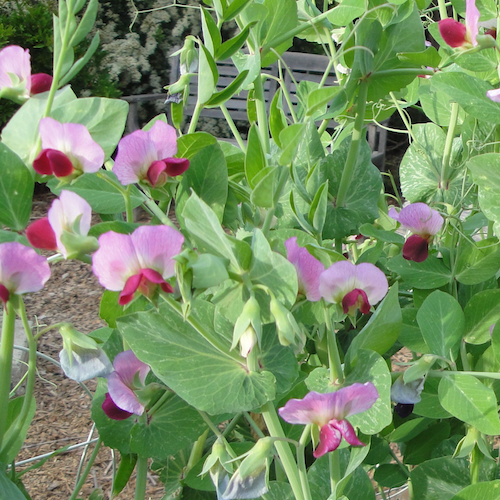 Lovely bicolored Dwarf Gray Sugar Peas resemble sweet pea flowers (which are NOT edible) and would be a winning combination with cool season flowers in your front yard. Eating sweet crisp pea pods with fresh salad greens and herbs, plus edible flowers from your own front yard may inspire you to expand your edible landscape into a beautiful productive kitchen garden by the time spring rolls around. A good approach is to start gradually. You can start this fall by adding these varieties that will overwinter well, then plan to add warm season edibles in spring and summer. Enjoy learning as you grow, gather ideas about what you enjoy growing and eating, and design features you’d like to add. If you are new to growing vegetables and herbs, getting some experience first will help shape your overall landscaping goals. Note: during our cool and rainy months in California you will have to have a plan for slug and snail control. Handpicking in the early morning or evenings is effective if you keep at it. You can supplement handpicking with a sprinkle of a non-toxic product such as Sluggo.